The "Greek Debt Crisis" is once again in the forefront since the EU leaders are meeting today and tomorrow - yet again - to figure out how to deal with it and the larger issue of debt and competitiveness inequalities across Europe. 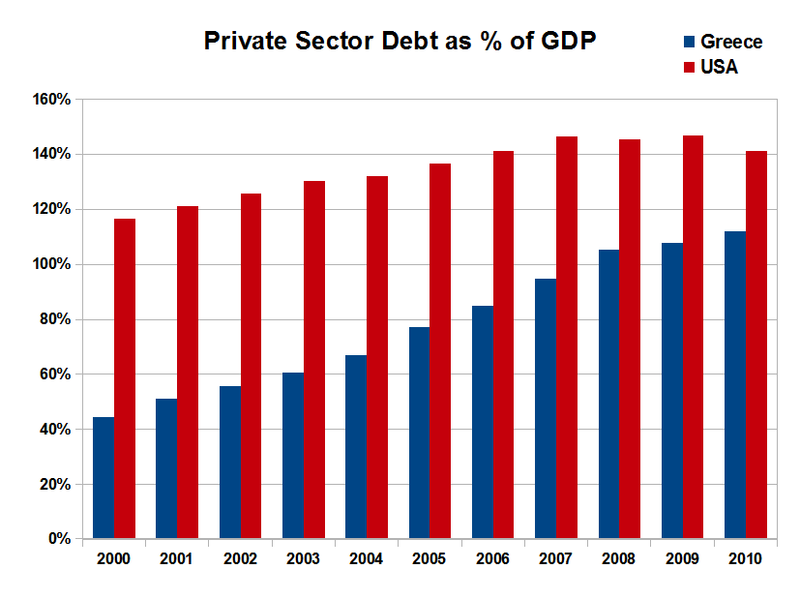 The discussion on debt, however, focuses almost exclusively on government borrowing - a mistake, in my opinion. Here's a chart that compares Greek and US private sector debt (households and corporations) as a percentage of GDP (it excludes financial sector debt). 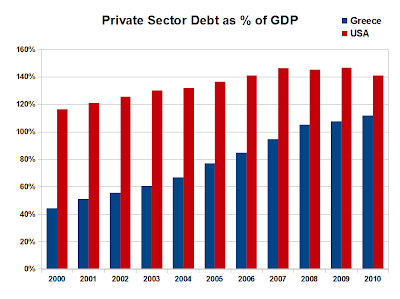 Note how fast Greek private debt rose once the country entered the eurozone: it literally exploded from 44% of GDP at the end of 2000 to 111% at the end of last year. Membership to the club had its (extremely dubious) privileges. This debt explosion fueled private consumption and, thus, GDP growth. Does it sound familiar? Of course it does; in the last decade Greece and the US went "shopping" for their economic models at the exact same bargain store: Debts 'R Us. 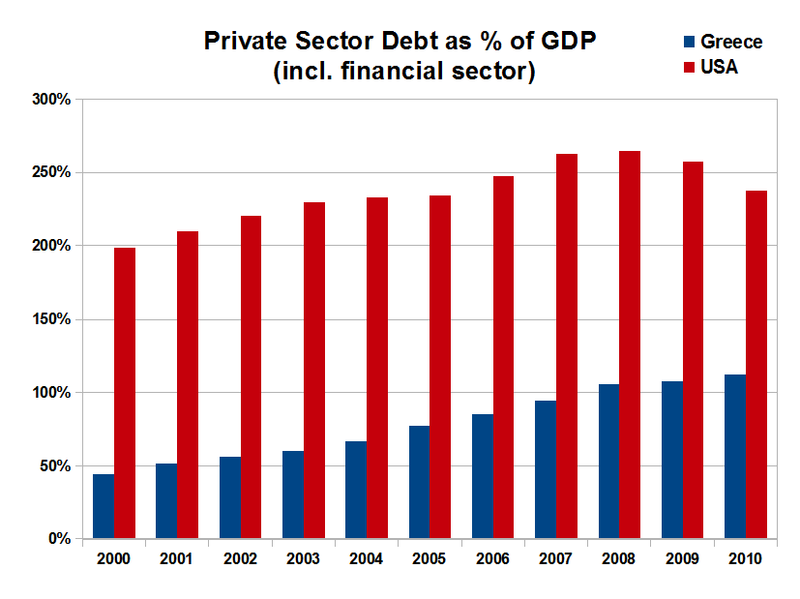 For another (admittedly more questionable) comparison, in the next chart I include debt of the financial sector. It changes our perspective, doesn't it? 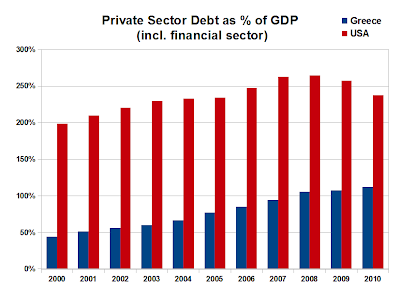 Including financial sector debt leads to double counting for some of the debt (e.g. securitized mortgage loans) and distorts the picture considerably. However, it does provide a valid warning that has to do with inter-connectivity, counter-party risk and financial globalization (think Bear Stearns, Lehman and falling dominoes). Update: After pulling an all-nighter, EU leaders agreed to extend the duration and lower interest rates on Greek loans. More intriguingly, they also agreed to allow the financial stability fund (EFSF) to purchase government bonds in the primary bond market, i.e. when new bonds are issued. (a) Provide real incentive for over-indebted countries to put their financial houses in order fast so they can go back to borrowing from the free market, benefiting from the underlying purchase support. (b) Convince markets there is real commitment to help eurozone countries when and if needed, but keeps the pressure on governments to reform their economies. In other words, it's a workable combination of carrot and stick - the latter being absolutely necessary to appease Mrs. Merkel's angry German voters who objected to outright bond purchases in the secondary market, viewing them as bailouts for profligate Greeks. Why do you want a solution? I'd rather it fall apart as it eventually should because the cash flows are not supportable. At that point, we need to have the will to turn away from monetarism toward something that benefits us all. But the US dollar is the Reserve Currency goes the argument. Can the US Government debase the currency until their debt is deflated (via currency inflation) to the comfort zone of deflated debt prices and low interest rates? Another way, can the US cause a global monetary crises and reap the benefit of flight to safety (the dollar) and destruction/debasement of competing currencies? Is this the game of chicken they are playing? "Why do you want a solution?" Because the alternative is (was) much, much worse. No one wants to see the EU fall apart, and this is precisely what is at stake here. I'm still trying to figure out what is going to happen as soverign debt origination expands globally at a breakneck pace. For now, I guess we will be issuing debt and then immediately monetizing it. Japan seems more interesting than the Euro area in this respect. And with respect to the EU, I thing they need a new solution that is not the current framework of the EU. Isn't this jockeying for power at the upcoming Brenton Woods (round II) forum? The US may not want dissolution of the EU but they may want to threaten the Euro. You think maybe the Bankers are telling their Representatives and President the "threat to National security" a the loss of Reserve Currency would mean? The era of the dollar as sole global reserve currency is at an end. The questions are: a) What will we replace it with and b) How to handle the transition. My hope is that we go from Permagrowth to Sustainability and devise a suitable currency regime (search for "Greenback" in some of my older posts). The Japanese tsunami/nuclear disaster is (yet another) warning bell about the Limits To Growth..
*I* want to see the EUSSR fall apart!